Wireless is the wonderful way the world is going, no doubt about it. We have wireless everything; from phones, internet, printers and keyboards. Now, one tech product company is boasting a reliable wireless method to stream what is on your PC or laptop to that large, flat panel HDTV on the wall. 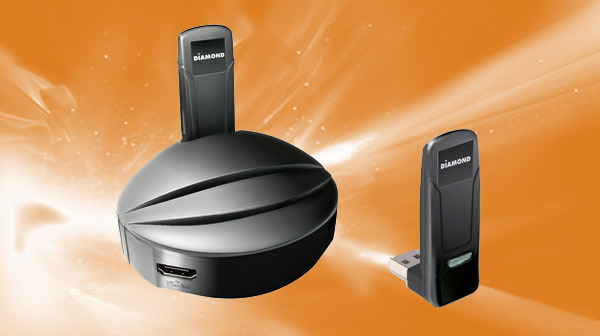 It is called the Diamond VStream Wireless HD Video Streamer USB, and it gives you the ability to take your computer content from your office desk chair to the comfort of your living room. Think of it this way; what your HDMI cable does for you can now be done with this wireless USB dongle. As a USB PC to TV streamer, it works in the line of sight for up to 30 feet, and can actually stream whatever is going on its compatible laptop onto its corresponding television screen at a 1080p resolution. Users can simultaneously work in other computer applications while they stream movies, music or photos. The Diamond VStream base is a rather minimalistic piece of equipment. Of course, the only drawback to that is that it has just a single HDMI output and no other audio or video options. Essentially, this means that a person with an older television or amplifier may not get the benefit of using the USB streamer. Due to the limitations of streaming technology, your video will likely lose the quality that you experienced on your computer. Slimmer than most USB adapters, it boasts two different ports; one is horizontal and the other vertical. Along with the base station, consumers will find a quick start guide, two USB transmitters and the needed HDMI cable. The only software that is needed is aptly named the Wireless USB Manager and setup is simple. Additionally, it will work with more than just your television—anything with a display is fair game! Have an HDMI projector? Go ahead and stream those slideshows or home movies to it. Nobody is going to complain about being able to watch this stuff on a bigger screen! Overall, the Diamond VStream Wireless HD Video Streamer is the closest way to make if you want to make your Netflix, Hulu and YouTube a more cinematic experience at an affordable price. Have you ever tried out a USB PC to TV streamer for your home entertainment? Sound off below! This entry was posted in Articles, Diamond VStream, TV Tuner, USB Devices, USB File Sharing, USB Future, USB Gadgets, USB Streamer, USB Technology, Wireless USB PC to TV Tuner, Wireless USB Technology and tagged Diamond VStream, Diamond VStream Wireless HD Video Streamer USB, Diamond VStream Wireless USB PC to TV Tuner, TV Tuner, USB PC to TV streamer, USB streamer, USB TV tuner, Wireless USB PC to TV Tuner. Bookmark the permalink.